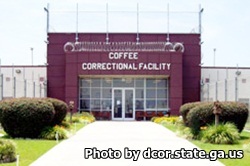 Coffee Correctional Facility is located in Nocholls Georgia, part of Coffee county. It is a medium security institution that houses approximately 2628 adult males who have been convicted of committing a felony offense. Inmates are confined in either one of five open dormitory units or in one of the two man cell units. An isolation and segregation unit is also available for inmates who present management problems or need to be separated from the general population for security and safety concerns. Eligible inmates are encouraged to participate in the vocational courses taught at this facility including carpentry, masonry, computers, horticulture, and earning your commercial drivers license. Academic courses include learning to read, adult basic education, and the ability for an inmate to earn their GED. Visitation is on Saturdays and Sundays from 9am-3pm. The days are alternated in which an inmate can receive visitation. Saturdays are inmates with a last name M-Z, Sundays are inmates with a last name A-L. This schedule alternates and rotates regularly, which is why we ask that you contact the institution prior to your visit to ensure your inmate's day.